On Tuesday singer Taylor Swift's social media accounts were hacked. 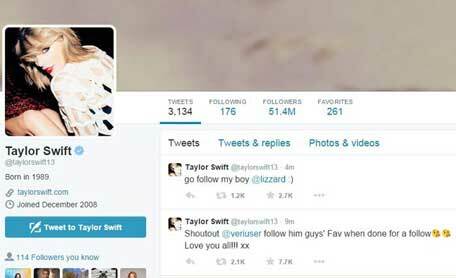 Multiple tweets went out from Swift's account telling her 71 million plus followers to follow @lizzard and @veriuser. These two usernames claim to have ties to a group of hackers called the Lizard Squad. The same messages were also posted on her Instagram account. The hackers then threatened to post naked photos of the singer. Swift, who has been holidaying in Hawaii, used her Tumblr page to inform fans her account was hacked. 'Well, now I'm awake. My Twitter got hacked but don’t worry, Twitter is deleting the hacker tweets and locking my account until they can figure out how this happened and get me new passwords. 'Never a dull moment." After regaining control of her account Swift addressed the hack, tweeting, "PS any hackers saying they have 'nudes'? Psssh you'd love that wouldn't you! Have fun photoshopping cause you got NOTHING." She added: '#HACKERS GONNA HACK HACK HACK HACK HACK,' in an ode to her hit song, "Shake It Off". The Lizard Squad claims to have hacked major gaming systems, such as Sony PlayStation and Xbox Live, last year. They also claim to be behind Tuesday's Facebook and Instagram outage.